Horror Sci-fi and More! : "AMERICAN VANDAL" WIRTERS SIGN UP TO DIRECT HORROR-THRILLER "THE BLOCK ISLAND SOUND"
"AMERICAN VANDAL" WIRTERS SIGN UP TO DIRECT HORROR-THRILLER "THE BLOCK ISLAND SOUND"
30 Bones Cinema, Hood River Entertainment, Captain Inertia Productions, and Title Media announced today that Kevin and Matthew McManus, aka The McManus Bros. (directors of FUNERAL KINGS, writers of the true crime Netflix series “American Vandal”), have signed on to direct the horror-thriller THE BLOCK ISLAND SOUND. 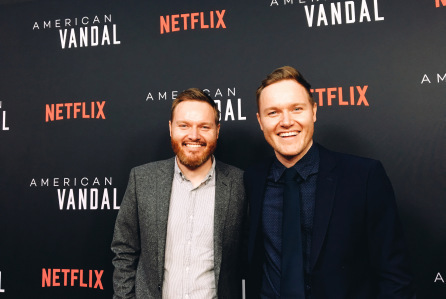 Written by The McManus Bros., this will be the duo’s sophomore directing effort and is scheduled to shoot in Massachusetts and Rhode Island this month. The film is produced by Andrew van den Houten (THE RANGER, THE WOMAN), Ashleigh Snead (THE RANGER), and The McManus Bros., with Darryl Gariglio, Jordan Rudman, Harvey Rudman, Catherine Dumonceaux and Giles Daust executive producing. THE BLOCK ISLAND SOUND stars Michaela McManus (INTO THE GRIZZLY MAZE, “Aquarius”), Chris Sheffield (THE MAZE RUNNER, “Aquarius”), Neville Archambault (13 CAMERAS, 14 CAMERAS), and Ryan O’Flanagan (“American Vandal,” “New Girl”), with Jeremy Holm (“House of Cards,” THE RANGER) rounding out the cast. The story follows Audry Lynch (McManus) as she returns home to Block Island only to discover her dad (Archambault) is suffering from a series of blackouts and hallucinations. After a particularly stressful night, her father goes missing, leading Audry and her brother, Harry (Sheffield), to search for answers. They’ll soon find out there is one ominous thread that ties everything together, putting their family in grave danger.